Joining the MARTA Police Department gives you the opportunity to serve millions of people while building a career in one of our nation's greatest cities. We hire candidates at various points in their careers — meaning a job with MARTA Police is a smart move no matter your experience. To apply for a MARTA Police job, head on over to our MARTA careers page and open the jobs portal to view all of our open positions. You'll need to create an account and sign in to use our jobs site. Once signed in, use the provided filters and any keywords you think of to narrow your search down to MARTA Police jobs. From there, click on the opening that you're interested in, and follow the on-page directions. Need help filling out the application or have any questions about the process? 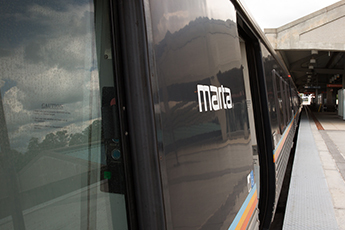 Check out our walkthrough on how to apply for MARTA jobs. Note: We can only process and consider complete applications. If you submit an incomplete application, it will not be considered for the position. After you finish applying, your application will be given to the appropriate investigator who will then review the information you submitted. Any information you provide concerning your qualifications is subject to verification. We'll contact you directly if we’re interested in interviewing your for the position. Your application will remain on file for six months starting from the date of application. If you have any interest in future job openings, visit our careers page. How do I apply for MARTA Police? Applications for all open positions are available on our careers page. What are the qualification requirements to be a Police Officer? You must be at least 21 years old, a United States Citizen, and have a High School Diploma or equivalent. When can I qualify for a specialized unit? You can qualify for a specialized unit after two years of experience with the MARTA Police Department and successful completion of any required training. How long will the background investigation take? Given its importance, the background check can take quite some time — sometimes up to six months. The length depends on the complexity of your background, the availability of support personnel and your ability to complete the required steps. Applications received by the MARTA Police Department will remain active during the background investigation and selection process. What testing is required for the police department? All applicants take a psychological exam, a polygraph exam and a physical exam that includes drug and alcohol screenings. How long does the Police Academy last, and do participants stay at academy? All MARTA Police recruits attend the Fulton County Safety Training Center. The Basic Mandate program consists of an 11-week training program. Recruits are not required to stay on site. Will I get paid while I am enrolled in the Police Academy? Absolutely — you become a paid employee of the MARTA Police Department once hired and will be paid at the current rate for all Police Officer Recruits. For promotion to the rank of Sergeant, you must pass a written exam, complete a two-week training class and participate in an oral interview. For promotion to the rank of Lieutenant, you must complete a one-week training class and an oral interview. Promotions for Majors and above are appointed. I live out of state; will the department work with me to facilitate my trips? Yes! Because we are a nationally recognized organization, we receive applications from around the country. And with that, we know it can be a challenge to complete the application process if you're not in the area. Whoever runs your background check will work with you to help you complete as many steps as possible while you're visiting Atlanta. What is the starting salary of a MARTA Police Officer? Does MARTA Police Department offer lateral transfer? The lateral transfer program will only extend to candidates certified through the state of Georgia. The program may extend to candidates with the supervisory rank of Lieutenant and above or specialized skills at the discretion of the Chief of Police. Salaries for these position will be determined on a case-by-case basis. Does MARTA Police Department have a Reserve Officer program? Yes. For more information, visit our Reserve Officers section.